Fancy something super-trendy for your next makeover? 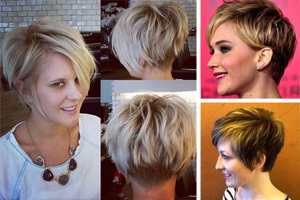 There’s nothing as stylish as a modern, choppy haircut on short hair, especially when you add a groovy new color! Feel as fresh and cool as a summer’s day in one of these face-flattering short haircuts for fine, medium and thick hair types! Lots of layers look great on medium and fine hair, adding tons of texture! Instead of adding curls for extra volume, a dab of styling product is all you need to get this tousled look with plenty of lively movement. The extra-long fringe can be swept to one side for an asymmetric look, parted in the center or worn high on top in a fancy quiff. The copper color has a touch of brown roots showing through the defined tresses and a cute blonde ombré framing the face! 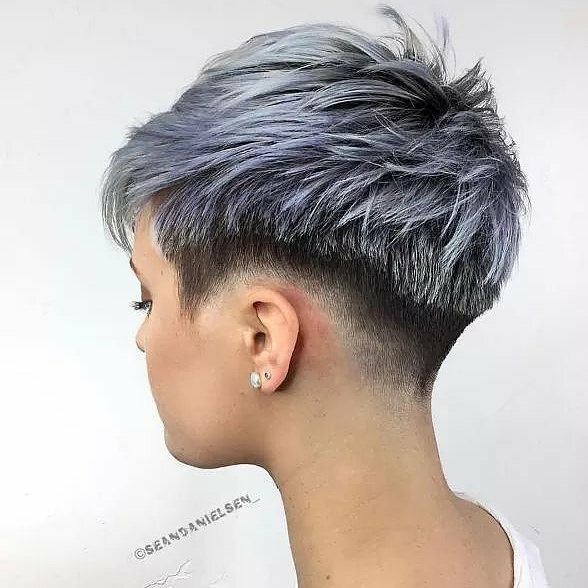 This pixie cut is made ultra-modern with bands of color ranging from black, through silver-blonde to lavender and then silver-gray! It’s a youthful, cutting-edge look for the fashion-conscious woman. And matching your wardrobe to your hair is all part of presenting this super-trendy cut and color! It’s best achieved on medium-thick hair, as this helps the definition of the layers. Combed forward from just below the crown into an asymmetric, side-swept fringe completes a stunning, urban chic haircut and color! 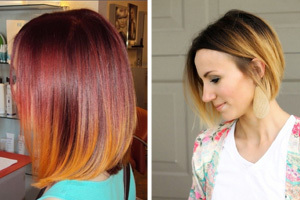 Here’s a radical cut and color that takes inspiration from Nature. 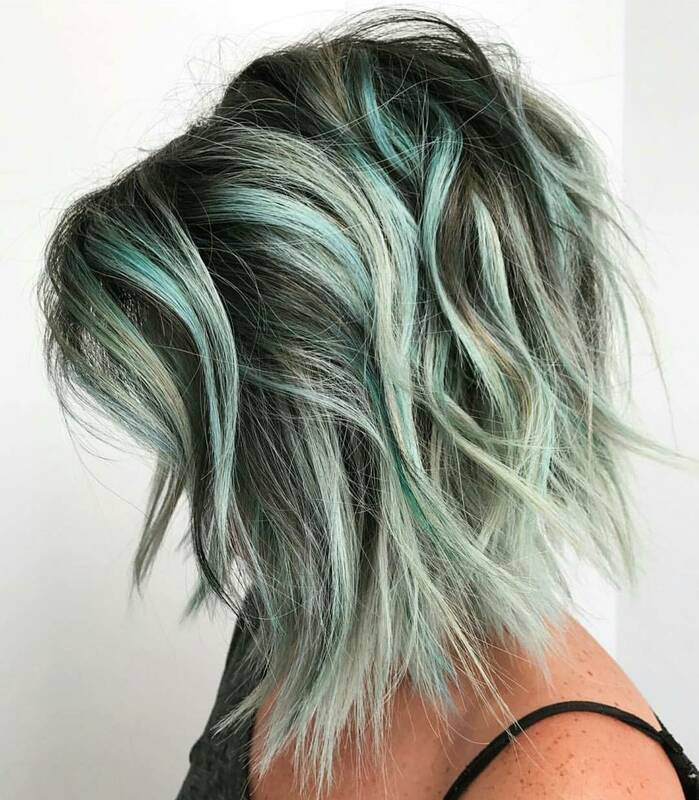 Shades of sea-green create light and dark texture on gray roots and pale-green blonde tips. The finish is also as wind-swept as a sea-breeze creating lively movement in this beautifully unstructured cut. This look is best achieved on medium to thick hair, with sliced layers removing the bulk from coarse hair. Thick hair allows for natural volume at the crown tapered down to spiky, highly textured tips. 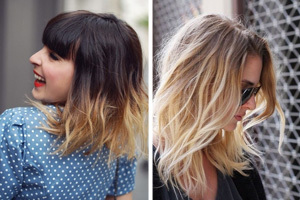 This messy medium bob is a fabulous high-fashion look! 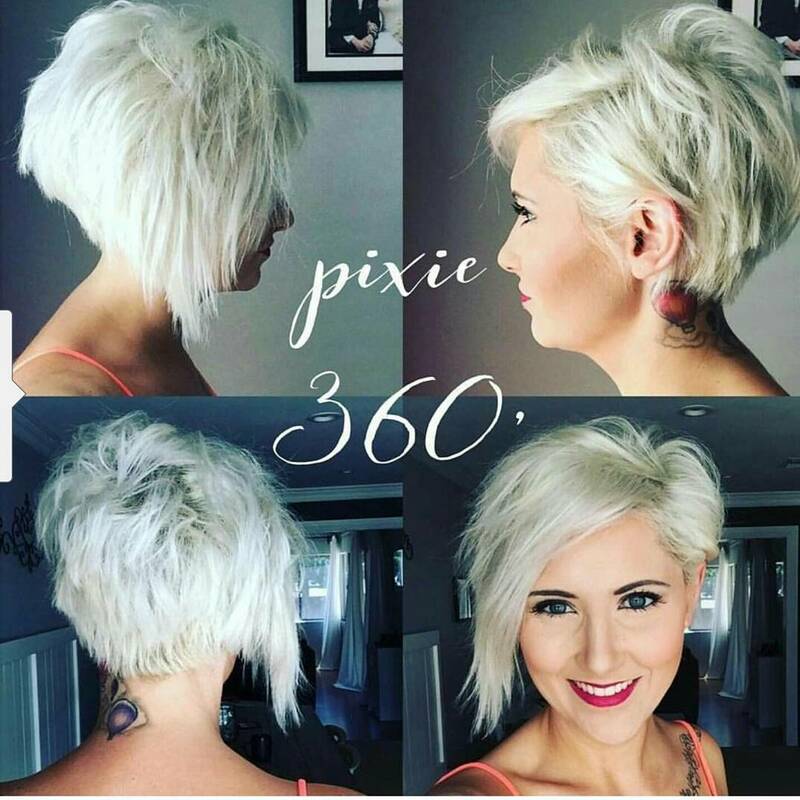 The short angled bob is a perfect way to show-off an eye-catching neck tattoo! Platinum-blonde is a high-fashion color creating an edgy, urban chic vibe, but you need to use lots of conditioner and limit your use of hot styling tools. 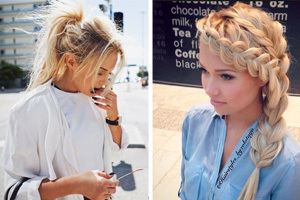 Highly bleached hair thickens from the action of the chemicals, so this look can be achieved on fine or medium hair. The blunt line of the stacked-back is carefully graduated down at a steep angle on one side, which is pushed casually behind the ear. 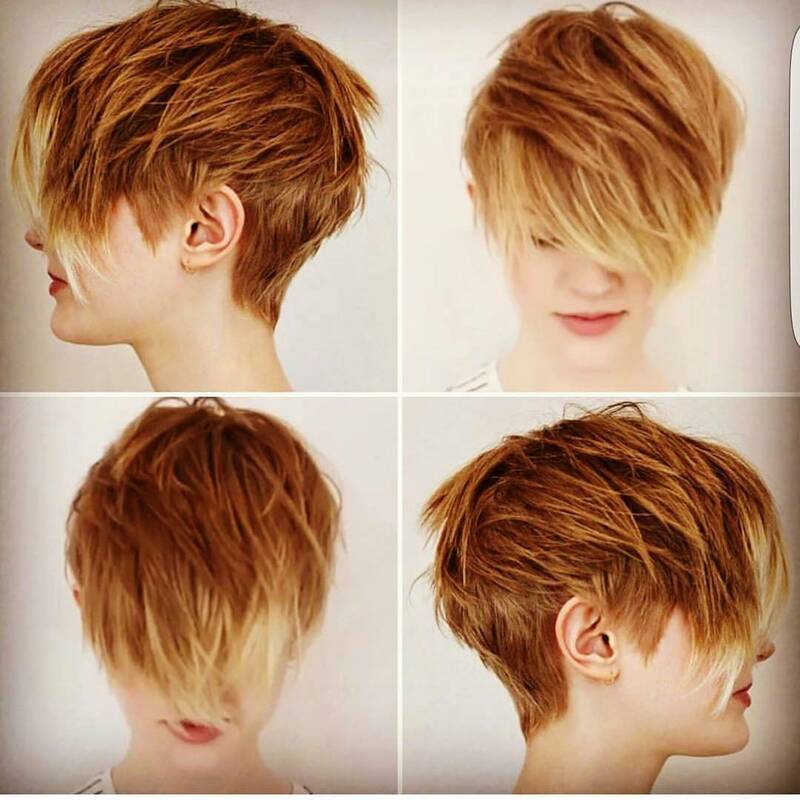 But the fringe side has a choppy, disconnected layer adding an ‘uneven’ vibe to an already asymmetrical look with four distinct views! This futuristic platinum blonde and black short haircut is even more ‘street’ in its urban style! The short back and sides are close cut, forming an undercut style with loads of personality. The amazing combed-over top creates a stiff, high quiff that frames the eyes and brow. And the deep, side parting contrasts intense black with strong outward movement in razored, white-blonde lines. 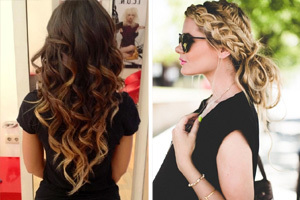 These 4 views show the difference between sides with black roots or all-over blonde, which is a more up-to-the-minute variation! 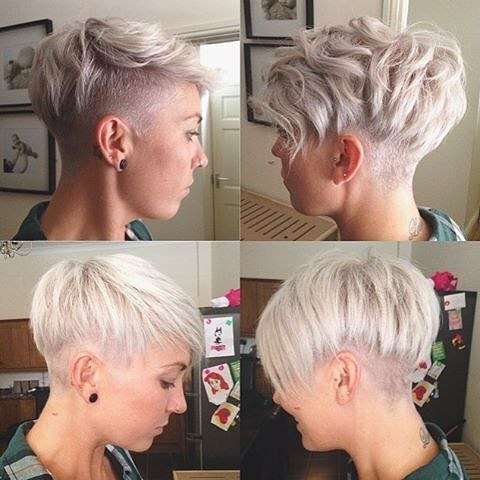 Here’s a pearly, neutral blonde shade with a touch of lavender toner for a super-trendy, chic short haircut. Although this blonde, and the platinum colors shown above are extra-light, there’s a vast difference in the looks they create. The platinum blonde with shaved sections and black roots was originally a ‘street’ look, which championed the move away from a carefully groomed and expensive hairstyles. 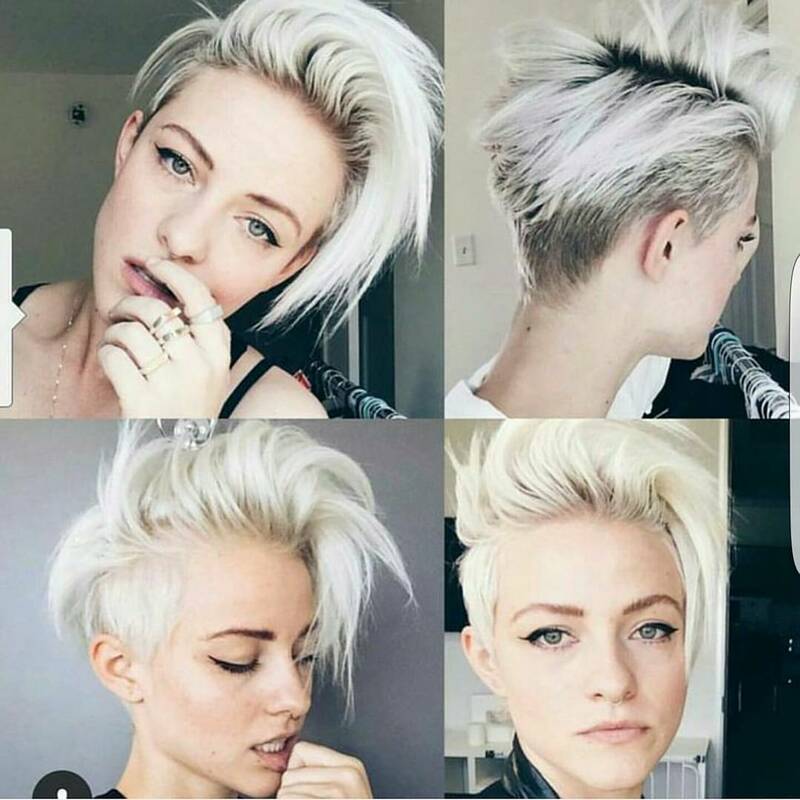 However, this pearly neutral-blonde pixie cut with shaved back and sides is a more feminine look. The model has fine, silky hair and the shaved sections look far softer tinted in the same pearl-blonde shade. 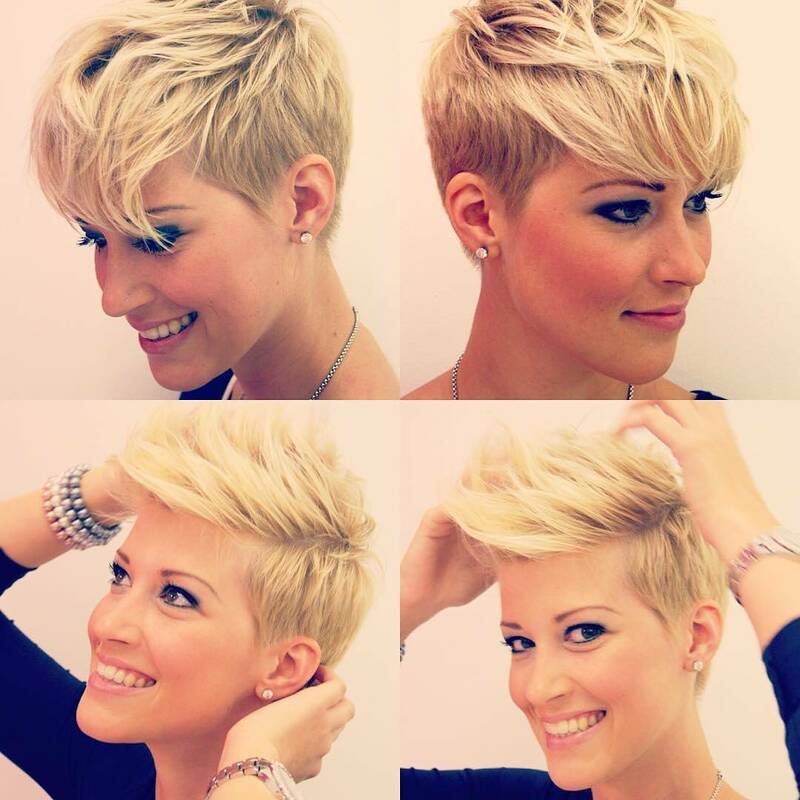 This is a lovely, happy-go-lucky set of hairstyle images which also shows a soft and feminine short haircut. The basic short back and sides cut, with long layers on top looks fabulous in this golden-blonde shade that suits pale to medium complexions, with a warm undertone. The long, forward swept fringe skims the brows to accentuate the eyes and show off a clean jawline and a graceful neck. And for variation you can steal the boys’ style with a fab ‘Tin-Tin quiff’ that’s full of texture and movement! I love how this delicate short bob haircut for fine hair resembles the gossamer strands of a puff-ball, ‘dandelion clock’! To keep the thickness on fine hair, the layers are long and then trimmed near the ends to create the curved-in shape. There’s a lovely touch of baby-blue ombré adding fashionable color at the tips and the silhouette shows a sweet, lightly-tousled curve. Along with an eyelash-length, straight-across fringe, this girly look is very dainty and appealing! 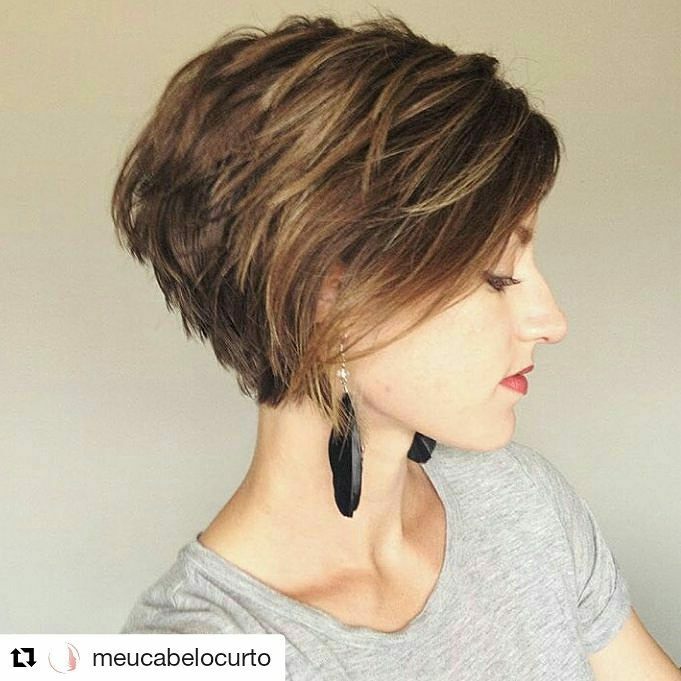 Here’s a medium length bob for medium – thick hair that projects style, confidence and a modern outlook on life! Long, sliced layers concentrate on shaping the hair into vertical tresses, tapered at the tips for easy, wash-and-wear shape. 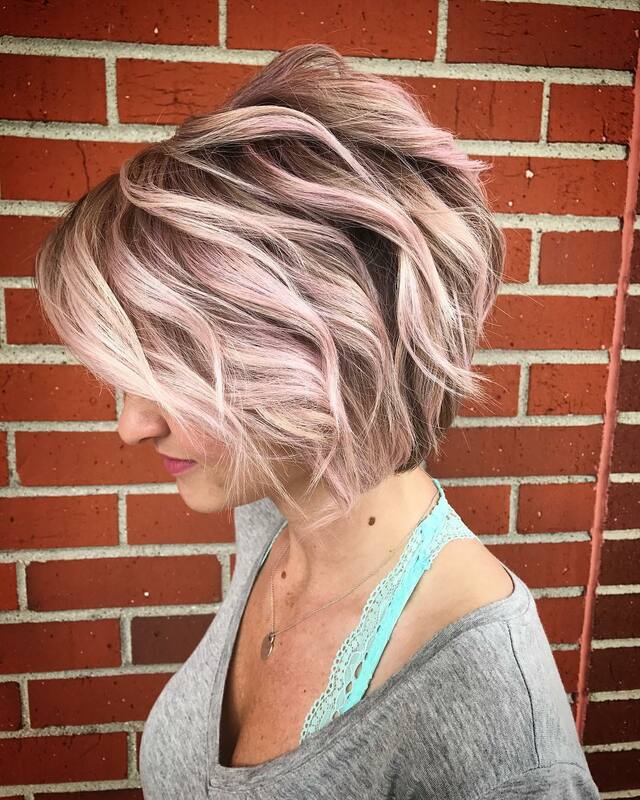 And the gorgeous balayage in white and pink is a fantastic example of how to get a 3-D effect and incredible color depth to thicken medium hair. 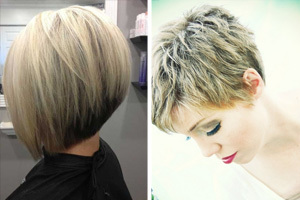 It’s a fab way to add lively movement, texture and sheer up-to-the-minute style to a medium bob and mousey-brown hair! If you’re looking for an elegant hairstyle for medium to thick hair, you must consider this great bob! 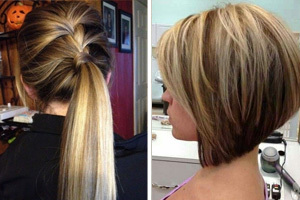 The style is full of layers highlighted in pretty caramel shades that are close to the light-brown base shade. This adds lots of lovely texture within the structured short bob with a lovely rounded silhouette. There’s a side-parting, which you can have adjusted to suit any face shape, and the long sweep of bangs meet the sides/back to form a cute V-shape! Adding soft honey and caramel shades creates a subtle sophistication on light-brown hair colors and grows out gracefully, too!